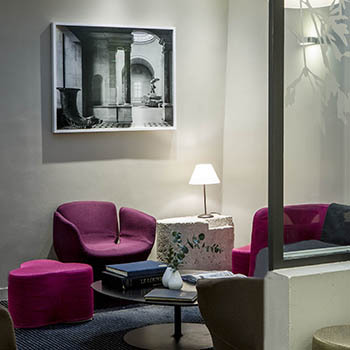 Hôtel de la Place du Louvre opens its doors to you in Paris' historical centre. Hôtel de la Place du Louvre stands in a 17th century building in Paris' 1st arrondissement, the beating heart of the capital's glorious past. To your right is Saint Germain l’Auxerrois Church, whose construction began in the 12th century and is famous for its bell, organs and many cheeky gargoyles which seem to flirt with the hotel. 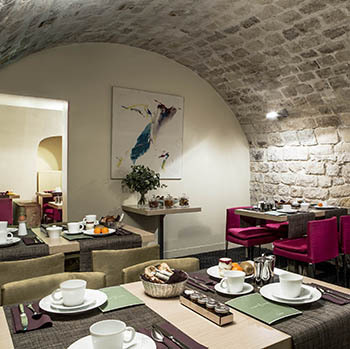 Legend has it that the hotel's vaulted cellars were once connected to the church's cellars. To your left, feast your eyes on another slice of Parisian history. Perrault's Colonnade, built between 1667 and 1770 after an architecture competition, is deemed a masterpiece of French classicism. During the 19th century the street was the meeting point for bohemians and intellectuals such as Chateaubriand, Balzac, Victor Hugo and Casimir Perrier who got together at Café Momus from 1841. Welcome to the heart of the 1st arrondissement, welcome to the heart of historical Paris.